to views in the weird world of money! A selection of the worlds most bizarre coins that are used as legal tender A recent Report showed that the people of America hate the dollar coin. This inspired us to do some research into some of the worlds most bizarre legal coinage to see if we could find some inspirational design alternatives for the dollar coin. Thanks to our cash advance loans company friends at AdvanceLoan.net for the their help with this. We’ve compiled a list of 25 most bizarre coins from all around the world! Yes, I know! All money is three dimensional but no coins other than these Somalis shapes have gone fully geometric. I can just imaging the pyramid one in your pocket digging into your leg, lovely. Palau is a former German colony and this coin commemorates the 600th anniversary of the Battle of Grunwald, which was the largest medieval battle ever. The coins are silver plated, each has a unique proof-colour finished picture, with each reverse side showing the Palau crest of arms. It’s motorbike shaped coins of course! Two sides like your average boring coin but with a colourful side for show and the obligatory stamp on the other side. 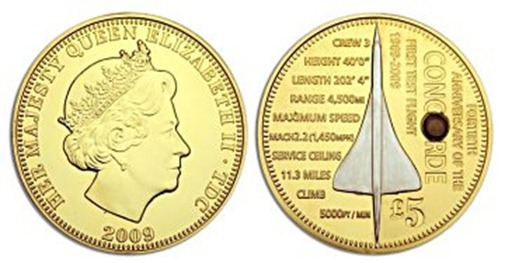 This coin celebrated the 20th anniversary of Concorde in 2009, it’s gold plated and each coin produced contained a tiny piece of Concorde’s titanium alloy heat shield, collect them all and build your own miniature Concorde! 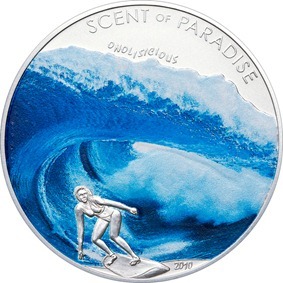 Not only does this coin have an awesome design but it also has it’s own scent, if you rub the coin then you can smell the scent of the ocean. It even has the word “Onoliscious”, a surfer slang meaning something really great, inscribed in the silver… dude! 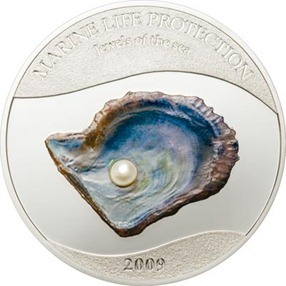 Another coin from the creative minds of Palau, this piece has real blue freshwater pearl embedded in sterling silver. 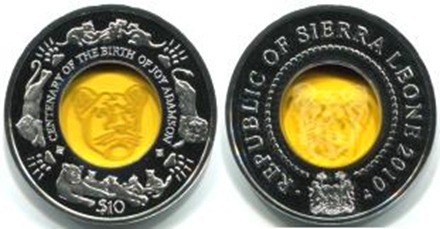 This coin commemorates the life of Joe Adamson, author of Born Free, with the lion from the book (Elsa) etched into yellow crystal. A must have piece of memorabilia for any die hard of the book turned Academy Award winning film. 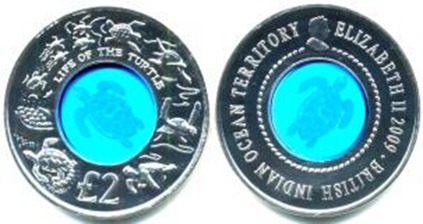 This £2 coin made by the British Indian Ocean Territory features a turtle etched into blue crystal embedded in a solid silver ring. Some people say that it is actually an alive turtle that is completely still and blue. 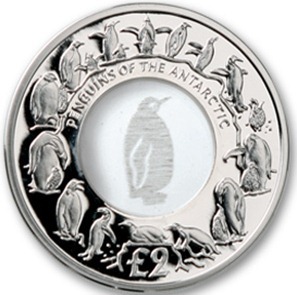 This elegant coin was crafted by the inhabitants of the South Georgia and The South Sandwich Islands, notice the crystal penguin and the penguins playing on the silver ring surrounding. 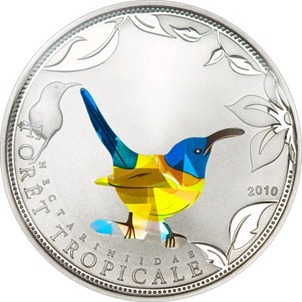 This Togolese coin features a prismatic sunbird, set in sterling silver, it’ flickers and changes colour when moved in light. If you don’t feed the prismatic bird regularly then it will fly to another coin. This coin from the Cook Islands features a Cloisonne Blue Pansy which is very rare in coinage as Cloisonne is an intricate and time consuming process, even though it looks suspiciously like a load of blobs, well it’s art apparently so get used to it. 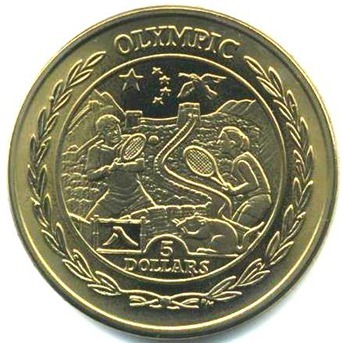 This odd yellow titanium five dollar coin was made to commemorate the 2008 Beijing Olympics, it shows primarily two gargantuous people playing tennis over the Great Wall of China and a giant bird in the background. If this actually happened during the games then I’d still just watch the football. 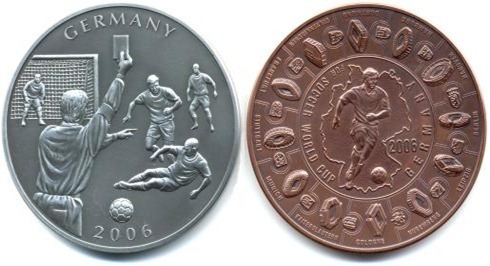 To commemorate the 2006 World Cup held in Germany, Liberia released giant 2.5″ (not really but for coins that is considered gigantic) fiver dollar coins with special football designs and themes. Oddly the coin on the right features a circular border of doughnuts, those Liberians are crazy! Yet another absolutely bonkers series of coinage from the ever reliable Somalis, the source of inspiration is natural wildlife. Notice the Buffalo is actually a cow in disguise, the back end gives it away. 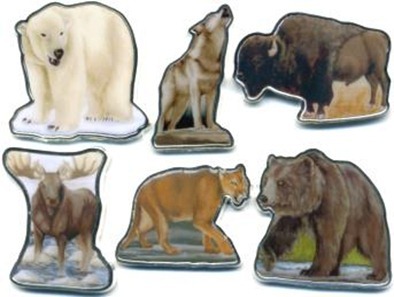 There is even a bear coin. 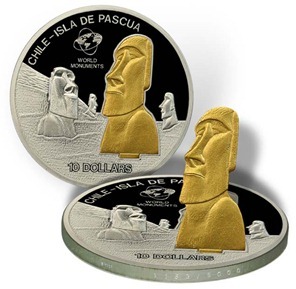 The famous head stones of Easter Island come to life with this celebratory coin, the gold plated ‘Moai’ can be put upright to give your coinage collection a new dimension. Legend says that the ancient stone heads each are powered by a single immortal hamster turning a wheel inside each stone statue. Green money but not the normal kind. 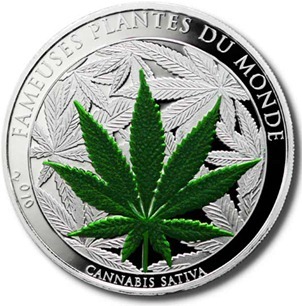 Benin have released this Marijuana coin, though it contains none of the “herbal remedy”, it does come with a special scent. If you try smoking this then you’re an idiot. The world’s first pyramid shaped coin was created by the Isle of Man, the copper crowned coin shows Tutankhamen’s Death Mask and a series of intricate hieroglyphics. For once, Queen Lizzy looks markedly underdressed compared to the regal Pharaoh. 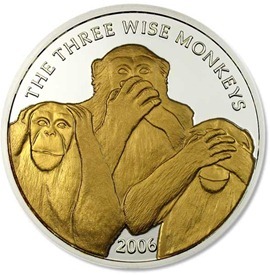 We could’ve made a top 20 from Somalis coinage alone, here they take three wise monkeys and turn them into gold whilst embedding them silver. Would these primates with such staunch morals approve of this clear exploitation of their message? Show off your brand new Lamborghini and start picking up girls instantly, well they might be a bit disappointed to find out it’s a small sized silver dollar coin. Notice how blue the coin is, marvellous. 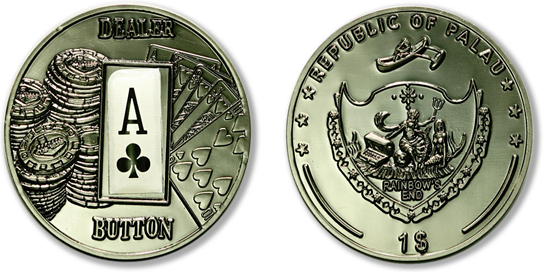 This coinage of Palau is 100% legal tender and can even be spent in Las Vegas casinos, the coin encases the corner of real playing card used in a tournament on the sunset strip. Remember house always wins was instead of gambling, just punch yourself in the brain, same outcome. The people of Somalia have great form in producing unique coins just like this Gibson Les Paul guitar shaped dollar coin. The fine detailing makes this example of coinage extremely beautiful and intricate. 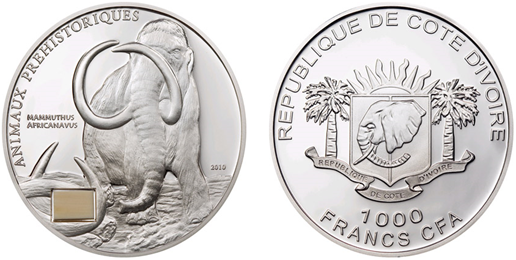 While it is strictly forbidden to include elephant ivory in coins, it is ironically allowed to include ivory from mammoths as seen here. It is possible to use the DNA from the ivory and actually make your own mammoth so get your chemistry kit out! This beautiful Mountain Blue butterfly is made using tiny, thin prism which makes the colour change and flicker in the light. 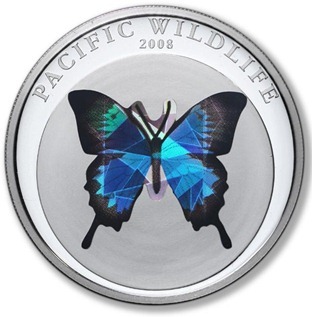 The solid silver sterling makes this coin extremely tidy and minimalist, which helps show off the prismatic butterfly in all it’s glory. Once again, Palau shows it’s history of German colonisation with this commemorative coin of the Teutoburg Forest Battle, the massive triumph effectively put an end to Roman expansion into northern Europe. 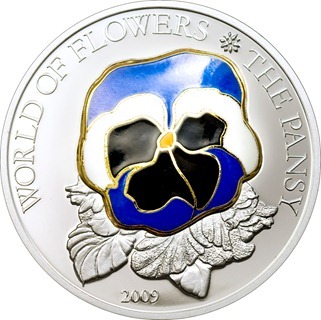 The coins are silver plated, each has a unique proof-colour finished picture, with each reverse side showing the Palau crest of arms. 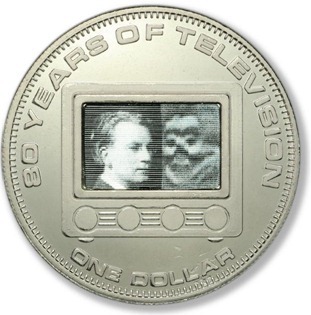 This coin celebrated the 80th anniversary of television when minted in 2006, the holographic image embedded into the sterling silver represents the first ever television images transmitted. The image on the left is John Logie Baird, the inventor of the electronic TV, and the image on the right is an evil electrical ghost that still haunts television sets today.